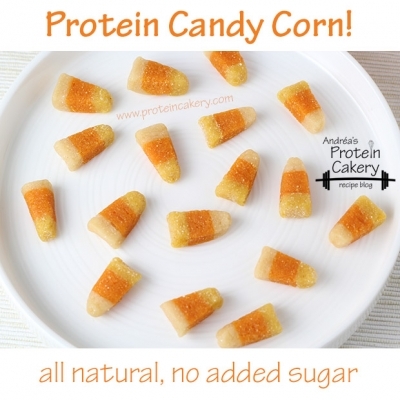 All-natural, no sugar added, high-protein candy corn! Your new favorite halloween treat! 1. Mix each color batter in a separate bowl. When you make the yellow batter, mix the turmeric in the applesauce before adding whey and coconut flour. 3. Layer the colors with the orange in the middle. 4. Slice into strips about Â¼" wide. 5. To make the candy corn, make alternating diagonal cuts into each strip. 6. Smooth the shape with your fingers (if desired). A note about substitutions: because each type of protein powder has a distinct flavor and texture, I would not try substituting different types of protein powders in this recipe.